A. Premature sprouting due to unseasonably warm weather is not unusual. This will not affect the bulbs themselves. 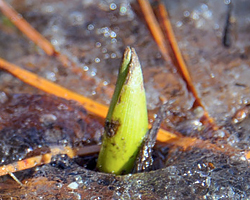 However, subsequent below-freezing weather may cause browning of early leaves, and, if buds have formed, prevent flowers from developing properly. No action is necessary to protect the bulbs themselves, but if more than 1 to 2 inches of leaf and/or flower buds are visible, we recommend covering the immediate area with a dry, lightweight mulch such as shredded dry leaves, straw, or sawdust. Once the danger of frost has passed, remove the mulch and allow the sprouts to grow naturally.